By Melissa 4 Comments - The content of this website often contains affiliate links and I may be compensated if you buy through those links (at no cost to you!). Learn more about how we make money. Last edited July 15, 2017 . Ten years ago, when my husband and I only had one child, we ate out. . .a lot. Every Friday night we ate out, but dining out two or three other times during the week was not unusual. We spent hundreds of dollars every month at restaurants. Our experience was not unique. 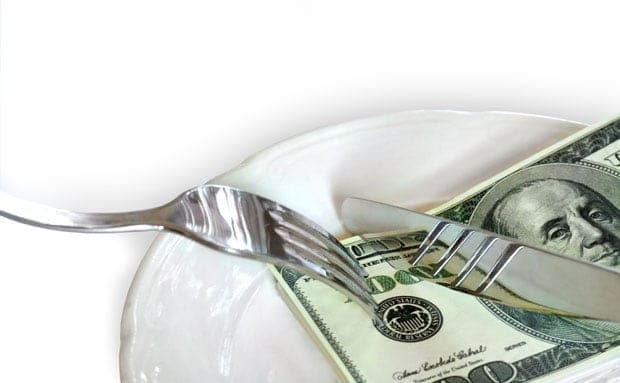 “According to the Bureau of Labor Statistics, in 2014, the average American household spent $2,787 on restaurant meals and takeout, compared to $3,971 on groceries. But in 2015, the average amount spent on restaurants and takeout jumped $221 to $3,008” (Fox Business). Now days, we have three children with growing appetites. Taking the entire family out to eat can easily run us $75 to $100, depending on the restaurant. So, we rarely eat out. Usually, we eat out less than a handful of times per year. I know what it’s like to come home from work drained. Who wants to cook? Or maybe you have to run the kids to an extracurricular activity, and you only have a small window to eat dinner. Rather than relying on restaurants or fast food, take the time to prepare some food ahead of time. 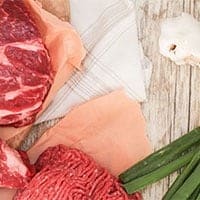 On the weekend, prep all of the ingredients that you’ll need for your meals so you can easily get dinner on the table during the weeknight. Or, make two or three meals on Sunday that you can simply reheat on busy weeknights. (One of my favorite chefs who creates recipes for just this purpose is Robin Miller from The Food Network’s Quick Fix Meals.) Another idea is to make double of any meal that you cook; eat one that night and pop the other one in the freezer. Then, you’ll have your own fast food in the freezer. Simply pull out a meal to defrost in the morning, and cook it up at night. Weeknight meals don’t have to be complicated. Pick simple meals for busy weeknights. Bacon, eggs, and toast (our favorite dinner—breakfast for dinner), comes together quickly. Hearty salads don’t take long to prepare if you have the ingredients prepped ahead of time. Grilled cheese or homemade burritos can be made quickly in a pinch. For inspiration, check out one of my favorite cookbooks, The Weeknight Dinner Cookbook. Online, you can find great recipes on Food Network—try 30 Minute Dinner Recipes. Even with the best laid plans of making meals ahead and trying to make quick meals, you may still find yourself empty handed some nights. For nights like these, you’ll want to have some convenience foods in your pantry and freezer. Yes, convenience meals cost more, but you’re still saving money compared to what you’d pay to eat out. Many times, years ago, I wanted to eat out because I was tired and stressed. I wanted comfort foods. We all have days like this. Rather than turning to dining out, create or buy your own comfort food. One of our favorites is Chicken Pot Pie, but I also buy frozen egg rolls for my kids when they’re craving Chinese. True, these aren’t the healthiest foods, but somedays we just “need” comfort foods. If you allow a time and place for these foods at home, you’ll be more easily able to resist the desire to eat out. How many times a week do you eat out? How do you combat the desire to eat out more frequently? 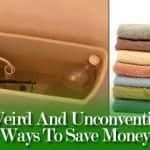 When you're looking for ways to make more money, here are a few unconventional and flat out weird ways that people are making money. Last Edited: 15th July 2017 The content of biblemoneymatters.com is for general information purposes only and does not constitute professional advice. Visitors to biblemoneymatters.com should not act upon the content or information without first seeking appropriate professional advice. In accordance with the latest FTC guidelines, we declare that we have a financial relationship with every company mentioned on this site. Pre-cooked and other convenience foods are indeed less healthy than homemade, but I agree, sometimes you just don’t have the time or the will to whip up something from scratch. We rarely eat out or rely on convenience meals though. Lately, we’ve been eating out about once a month. I don’t mind though, I love cooking and am always eager to try new recipes! Excellent post! We fall into the trap too often of dining out when we really don’t need to. Our focus now is to try and limit dining out to once per week and at restaurants that aren’t 3 or 4 dollar signs. With two 4 year old kids we’re starting to see the growing appetites – it won’t get cheaper anytime soon! We have 1 child with a second on the way. For us, dining out has nothing to do with not wanting to cook. We are social people and when you are around a 4 year old all day…….YOU NEED TO GET OUT OF THE HOUSE!!! Going out to eat keeps the whole family from going stir crazy. From a money standpoint, we typically dine at fast casual restaurants $8/adult $4/kid, one could argue at times it’s as cheap as eating at home. The real problem is that we don’t necessarily tame our grocery spending on the weeks were we dine out a lot, so it’s a double whammy. We plan our meals for the week, and try to have ingredients on hand for simple quick fixes as well. The cookbook Saving Dinner is a go to for us too. We are saving for retirement and find food expense is one of the few adjustable budget items.